Graphic Novel Review 33/365: Zodiac Starforce – Dark Horse Week! Dark Horse Week continues with the colorful Zodiac Starforce. If you are into action-packed, colorful stories, driven by powerful women, then this is the book for you! This, and Jem and the Holograms. I guess I have to start with the elephant in the room, if you are a Jem fan, then you will notice some similarities in the books. The back matter even tells us that Zodiac started as a crime fighting rock band, and I’m guessing the fan crossover is huge. But this book stands on its own. One of the reasons is that while you only get issues 1-4 compiled in this Dark Horse graphic novel (lots of cool back matter for fans of the characters), there are a lot of words on these pages and they are dense with art. No space is wasted on the pages of Zodiac Starforce. Just flip through it to see what I’m talking about. Packed pages of words and art. Pound for pound one of the most word dense books that I’ve reviewed. This is a good thing if you are looking for lots o’ story in few single issues. The team here gets through as much story in four issues as most take six to do. One of my only concerns is that the characters are supposed to be in high school, but they seem to be much older. The way they act, the way they talk, and their social interactions outside of school would put these characters in college. And I don’t think it would have done any harm to have created them at that age. It’s a small issue though, and if you are not around high school kids on the daily like I am, you might not even notice. From what I see, if high school kids had to save the world, we’d be screwed! Just kidding if any of my students read this…you are great, and I’m sure you could save the world…maybe. I had a lot of fun writing this graphic novel review, cheers! 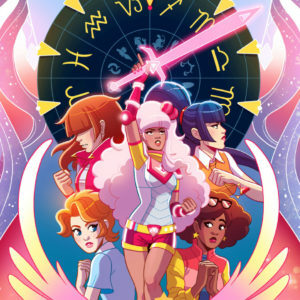 Now, go explore the colorful wonderment of Zodiac Starforce!